XIAFLEX is a prescription medicine used to treat adults with Dupuytren’s contracture when a “cord” can be felt. • Physical therapist will look for the source of your joint issues, and work to treat those injured structures. •Occupational therapist may help you improve the life skills needed to adapt to joint problems. "The communication and team work shown by the staff at this office is awesome." "Love this practice....very efficient and timely with a friendly staff!" "He has an amazing bedside manner and answered all my questions." "I highly recommend Dr. Elzik and this facility." "I'm 9 weeks post surgery and I'm very happy with my recovering results." "Dr. Elzik is well experienced and also has terrific bed side manner." "Excellent. Dr. Elzik is a well-qualified hand orthopedic surgeon." "The staff were friendly, efficient and helpful." At South Orange County Orthopaedics, Inc, patients living in and around Mission Viejo, California, have access to a team of professionals with an unparalleled core of education, training, and skill. State-of-the-art technology and a commitment to remaining on the cutting edge of orthopaedic medicine define this practice. The physician team at South Orange County Orthopaedics, Inc, brings a broad range of skills to the clinic. Patients have access to specialists in sports medicine, joint replacement, microvascular repair, physical therapy, and surgical procedures for virtually all joints within the human body. They provide services and care in a welcoming, comfortable environment where technological innovation is an integral part of the practice of medicine. A highly individualized approach ensures that patients are always treated as people to be healed and not like numbers to be processed in and out of the office. South Orange County Orthopaedics, Inc, would not be complete without the work performed by a fantastic paraprofessional and support team. From the moment a patient walks through the door to the time they leave the office, our team takes the time to make sure that every person in our care feels welcomed, supported, and valued. That dedication to service is why so many people in the greater Mission Viejo area turn to South Orange County Orthopaedics for comprehensive orthopaedic care. 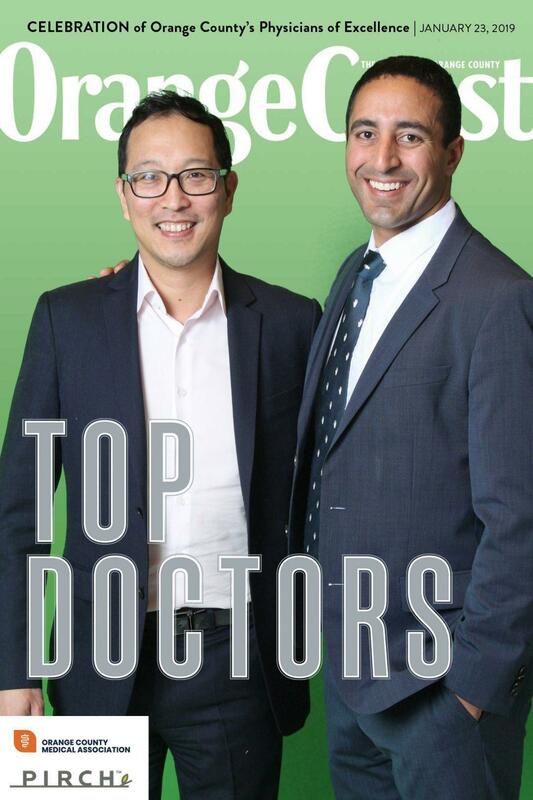 The Orange County Register and Coast magazine, in partnership with Orange County Medical Association (OCMA), honored Dr. Fitzpatrick, Dr. Elzik and Dr. Park for going above and beyond for their service and overall patient satisfaction. Congratulations to all the other honorees for the respected work they provide each and everyday, while making patient care the number one priority! At South Orange County Orthopaedics, Inc, we accept most major insurance plans. Here is a short-list of just some of the most popular plans we accept. Please contact our office if you do not see your insurance provider listed. "I never had a surgery of any kind and I'm happy to say that it was as good as it gets." "I personally have been very happy with the the services provided. I rarely have to wait more than 10 minutes past my appointment time." "So clear on how and why I need the operation. I'm thankful for all the work."